The Navy assisting the fisherman. The Navy rushed a fisherman, who suddenly fell ill, ashore for treatment on Sunday. 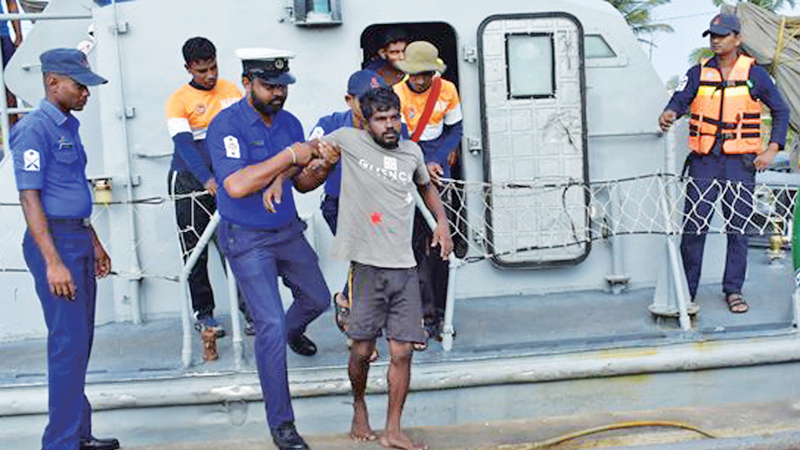 The fisherman was aboard the multi-day fishing trawler ‘Madushan Putha,’ which left the Galle fishing harbour on Saturday. In response to information from the Fisheries and Aquatic Resources Department about the patient, a Fast Attack Craft (FAC) attached to the Southern Naval Command was dispatched to retrieve the patient. Accordingly, the patient was transferred safely to the FAC at the seas about 64 nautical miles off the Galle lighthouse and was rushed ashore while administrating first aid. Upon arrival at the harbour, he was rushed to the Teaching Hospital of Karapitiya for treatment. The Navy continues to assist and rescue fishermen, and seamen onboard merchant ships, who face challenges at sea.